Welcome to our new website! We are very excited to allow our customers, and potential customers, to now find us on-line, view our menus, gaze at the dishes we serve up and be able to contact us quickly and easily. 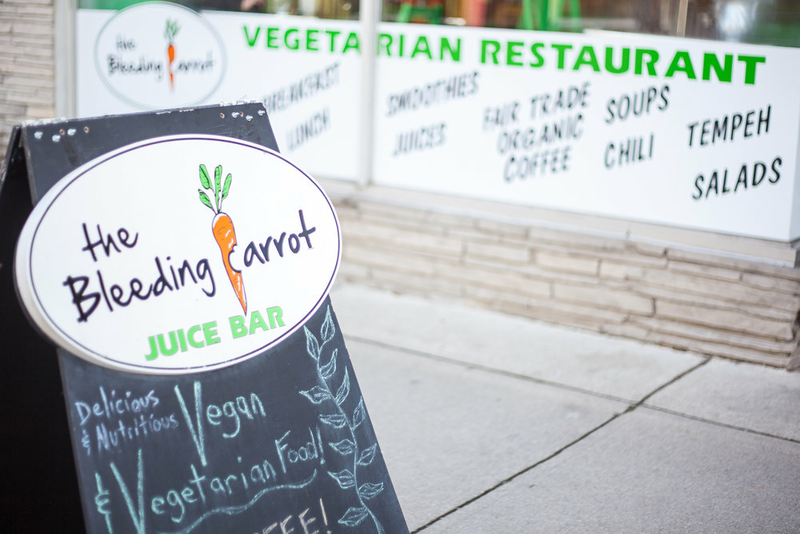 We are proud to be a part of the Owen Sound, Ontario community and to provide delicious, healthy and compassionate cuisine to vegetarians, vegans and omnivores alike. The Bleeding Carrot has been a staple in downtown Owen Sound for several years now. We have established a loyal clientele and continue to grow our business year-in, year-out. 2016 has been our best year so far and we look forward to enticing new customers to come try our great food and experience our friendly service. One of the things we decided to include on our website is this blog. We will use this forum to provide our customers, and the greater community, with information as it relates to upcoming events, not only those that we may host here at The Bleeding Carrot, but those around town we feel will be of interest to our customers. Some of the events we have hosted at the restaurant have been film and documentary screenings. Sometimes these screenings include guest speakers who engage with viewers and customers in Q&A afterwards. We will look to offer similar functions in the future as well as various information sessions and entertainment events. It is also worth noting that we have an active "information centre" located just inside our front door - this is a courtesy we provide our clientele to help them connect with upcoming events and various service providers in the greater Owen Sound area. We also provide literature as it relates to vegetarian eating and compassionate food choices. So please be sure to check back here from time-to-time to learn of upcoming events, menu changes, new food offerings and other announcements. And if you haven't been to The Bleeding Carrot in person, please stop by and give us a try - you won't be disappointed! By the way, anytime you wish to reach out to me personally, or staff, don't hesitate by either calling or sending us an e-mail via our Contact Us page.